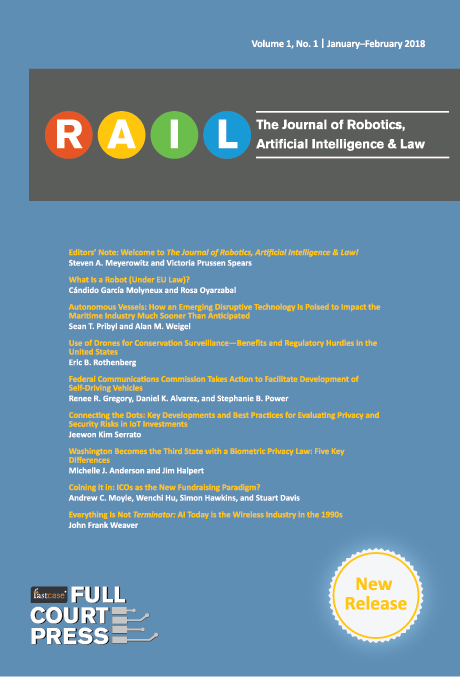 The Journal of Robotics, Artificial Intelligence & Law (RAIL) is the ﬂagship publication of Full Court Press, an imprint of Fastcase. Since 1999, Fastcase has democratized the law and made legal research smarter. Now, Fastcase is proud to publish books and journals that are pioneering, topical, and visionary, written by the law’s leading subject matter experts. Look for more Full Court Press titles available in print, as eBooks, and in the Fastcase legal research service, or at www.fastcase.com/fullcourtpress. The inaugural issue of RAIL launched on January 8, 2018. Want to try RAIL? Request your free digital copy of one article of your choice from the first issue below. RAIL is available digitally on fastcase.com. Print copies of each issue will be shipped upon request. A subscription will also include curated whimsies from the publisher. Click here to purchase the print edition.